How Do You Know When It’s Time for a Custom Solution? Obviously a big factor for consideration. 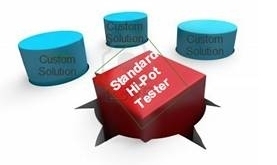 While most full featured hi-pot testers will put a dent in even the most considerable budgets, there’s another solution that costs less and is a better fit for your own manufacturing processes. People are usually surprised to find that they can have a fully automatic test station with data acquisition included for less than the price of a micro-processor type hi-pot tester. Which leads us to our next point. There have been considerable advances in data acquisition in the past decade when it comes to testing industrial equipment. It’s become so affordable and efficient, you can usually get a test station designed to your specs for less than you would spend on the components to build it. All companies recognize having full and complete records of every production test on a real time basis is invaluable. Everything from rejection rates, liability protection, quality trends, production flow and management reports can be pulled to diagnose your testing programs in a custom solution. However, these features are not always included in a standard hi-pot testing unit, so be sure to evaluate this when considering new equipment. The last thing, but arguably the most important to consider, is how well does the solution you’re looking at match your current manufacturing processes and flows? Does a plug and play tester suit your needs, or would you find value in having an automated test station with data acquisition and a wide range of test programs included? These are all things that need to be considered when looking at implementing or upgrading your test equipment within your organization, and while there’s no easy answer, you’ll have a much better idea of what you need and if a custom solution is right for you after evaluating these criteria.